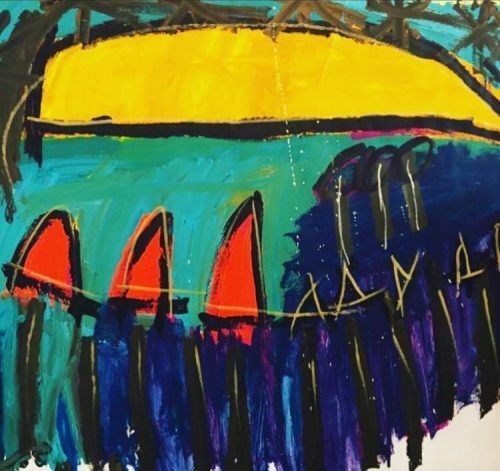 Coinciding with Autism Awareness Week last month, ‘Art by Johnny’ was a fabulously vibrant exhibition held at Phoenix Studios in Brighton, comprised solely of Johnny Carroll-Pell’s paintings. Johnny is a 20-year-old autistic artist who has been a member of the Rocket Artists studio for two years. In this time, he has honed his paint, brush and oil skills to create work in a variety of styles. Emma Robdale investigates. 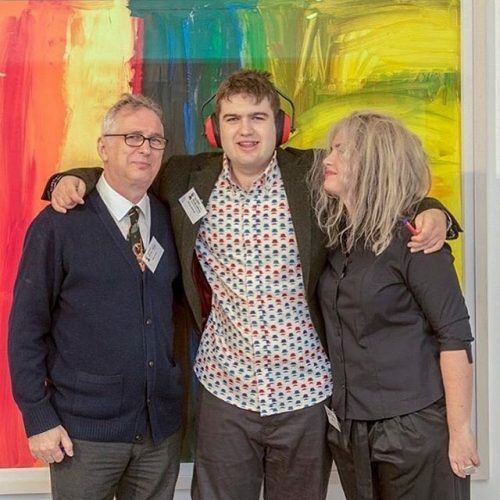 Johnny with his parents, Henry Normal and Angella Pell, in front of one of his paintings. Photo from johnnycarrollpell/Instagram. 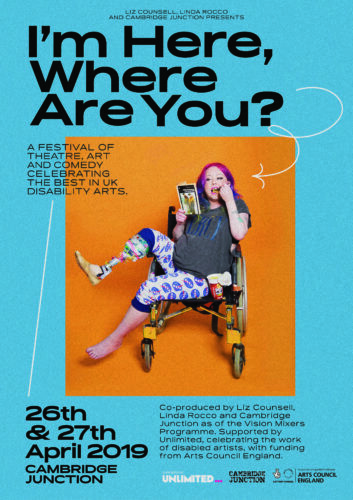 Johnny’s father, Peter Carroll, is more famously known by his comedian name Henry Normal, and his mother, renowned screen-writer Angela Pell, both wholeheartedly support Johnny’s artistic career. “I’m pretty sure that through his work Johnny is doing his bit to educate people about expectation, expression and communication,” writes his father. Despite much success as a TV producer Carroll claims his best achievement so far is his book, A Normal Family which depicts Johnny’s experiences growing up. Only a selection could fit into the Phoenix gallery’s two wings. 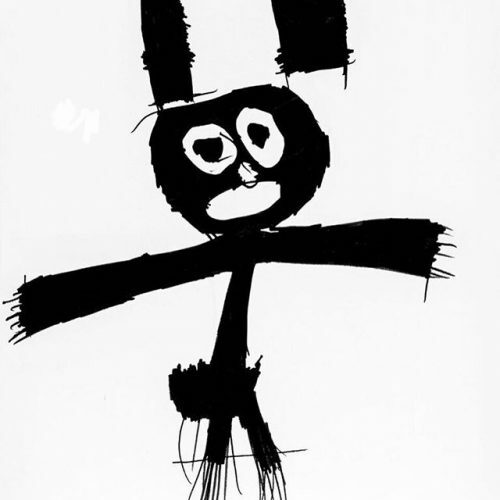 The right wing exhibited the bulk of Johnny’s paintings. Nestling on the walls were exhibits that ranged from Kung Fu Panda and David Bowie, to landscape art. One of the largest paintings was Mountains, an acrylic piece on paper involving thick lines and a bold abstract use of shape. In the left wing the walls and floor were covered in coloured tape overlapping in zigzags and curves. These lines represented the ‘Yes/No/Maybe’ game that Rocket Artists played with Johnny to encourage communication. It involved kicking a ball to locations and asking ‘Yes’ – orange, ‘No’ – blue, ‘Maybe’ – green. Rocket Artists traced the ball’s trajectory with tape to represent the game visually. Right wing of gallery depicting the ‘Yes, No, Maybe’ game. Photograph: Emma Robdale. Johnny paints images from his everyday life. He also tends to paint the same themes in set places; at home he paints hills and trees, but at Rocket Artists’ studio he mainly paints figures. When starting his paintings Johnny tends to do the outlines in yellow first, then adds other colours. Angela spoke about how Johnny became interested in art when he was about four years old. “I remember he drew a rainbow on the wall. That was the first time I got really excited that he’d done something using pens unprompted.” Since then he has just kept going. Not only were the paintings on the wall designed by him, but also the stools, the cushions and even the speakers! 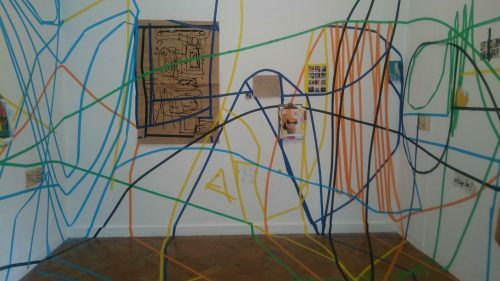 The whole place truly embodied ‘Art by Johnny.’ And Johnny, adorned with ear defenders because of his sensitivity to noise, clapped his hands in excitement while striding around the gallery accompanied by relatives and friends. Stools, speakers, cushions from gallery. Photograph: johnnycarrollpell/Instagram. 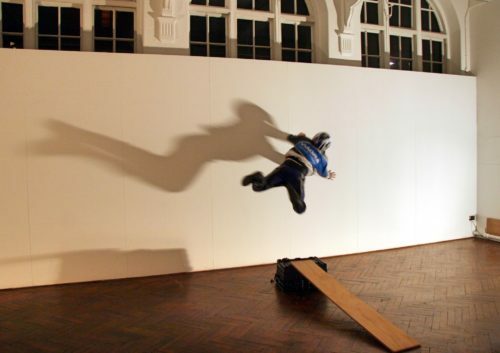 During the month-long exhibition Phoenix gallery hosted weekly talks on Johnny’s influences. Amongst them was Dido Fisher, a horse whisperer. She spoke about her work with Johnny over several years and how she had watched his communication skills grow while bonding with her two horses, Magpie and Dylan. Mountains, on canvas. Photograph: ‘Art By Johnny’ Facebook.